Saint Tatiana the Deaconess and martyr. Saint Tatiana was a Deaconess and martyr of the early church in 3rd century Rome, during the reign of Emperor Alexander Severus (222-235). Her feast day is celebrated on January 12. Tatiana was a Roman whose parents were of great nobility. Her father was a Roman civil servant who was secretly a Christian and raised his daughter in the faith. She was made a deaconess in one of the Roman churches and served God in fasting and prayer, tending the sick and helping the needy. This was dangerous for that period, and one day the jurist Ulpian captured Tatiana and attempted to force her to make a sacrifice to Apollo. She prayed, and miraculously, an earthquake destroyed the statue of Apollo and part of the temple. The demon inhabiting the idol fled screeching from that place. Those present saw its shadow flying through the air. Tatiana was then tortured. They tore holy virgin's eyes out with hooks, but she bravely endured everything, and prayed for her tormentors that the Lord would open their spiritual eyes. And the Lord heard the prayer of His servant. The executioners saw four angels encircle the saint and beat her tormentors. Seeing this, eight of them believed in Christ and fell on their knees before St Tatiana, begging them to forgive them their sin against her. For confessing themselves Christians they were tortured and executed, receiving Baptism by blood. The next day St Tatiana was brought before the wicked judge. Seeing her completely healed of all her wounds, they stripped her and beat her, and slashed her body with razors. A wondrous fragrance then filled the air. Then she was stretched out on the ground and beaten for so long that the servants had to be replaced several times. The torturers became exhausted and said that an invisible power was beating them with iron rods. Indeed, the angels warded off the blows directed at her and turned them upon the tormentors, causing nine of them to fall dead. They then threw the saint in prison, where she prayed all night and sang praises to the Lord with the angels. A new morning began, and they took St Tatiana to the tribunal once more. The torturers beheld with astonishment that after such terrible torments she appeared completely healthy and even more radiant and beautiful than before. They began to urge her to offer sacrifice to the goddess Diana. The saint seemed agreeable, and they took her to the heathen temple. St Tatiana made the Sign of the Cross and began to pray. Suddenly, there was a crash of deafening thunder, and lightning struck the idol, the sacrificial offerings and the pagan priests. Once again, the martyr was fiercely tortured. She was hung up and scraped with iron claws, and her breasts were cut off. That night, angels appeared to her in prison and healed her wounds as before. On the following day, they took St Tatiana to the circus and loosed a hungry lion on her. The beast did not harm the saint, but meekly licked her feet. As they were taking the lion back to its cage, it killed one of the torturers. They threw Tatiana into a fire, but the fire did not harm the martyr. The pagans, thinking that she was a sorceress, cut her hair, thinking, according to their pagan reasoning, that some sorcery or some magical power was concealed in her hair. Then they locked her up in the temple of Zeus. On the third day, pagan priests came to the temple intending to offer sacrifice to Zeus. They beheld the idol on the floor, shattered to pieces, and the holy martyr Tatiana joyously praising the Lord Jesus Christ. Finally, Tatiana along with her father were both beheaded on January 12. Thus, Tatiana ended her earthly life about the year 225 A.D., and this heroic virgin, who had the fragile body of a woman but a robust and valiant spirit, was crowned with the immortal wreath of glory. 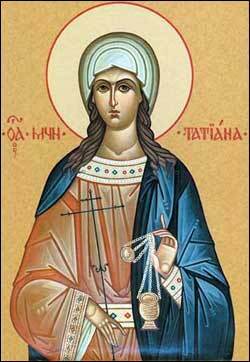 Tatiana is venerated as a saint, and her feast day is on January 12. The miracles performed by Saint Tatiana are said to have converted many people to the fledgling religion. Saint Tatiana is a patron saint of students, and in Belarus, Russia, and Ukraine, "Tatiana Day", also known as "Students Day", is a public holiday. The similarity of her life with those of Martina and Prisca has led some to question whether they may even all be the same person, or if perhaps similar hagiographies were assigned to them posthumously. There is no early evidence of veneration of either Martina or Tatiana in Rome, and Prisca (or Priscilla) is hard to identify. and by thy courage put Belial to shame. We beseech thee to deliver us from the power of the evil one. and in the royal purple of thy blood thou didst fly like a dove to heaven. Wherefore pray unceasingly for those who honour thee. OCA.. Martyr Tatiana of Rome, and those who suffered with Her. Prologue from Ochrid. The Holy Female Martyr Tatiana. Holy Virgin Martyr Tatiana of Rome. Great Synaxaristes: (Greek) Ἡ Ἁγία Τατιανὴ ἡ Μάρτυς. 12 Ιανουαρίου. ΜΕΓΑΣ ΣΥΝΑΞΑΡΙΣΤΗΣ. This page was last edited on October 22, 2012, at 17:33. This page has been accessed 15,101 times.